In a celebration of indigenous culture that ranges from Canada to Mongolia, six dancers recreate a stampede. 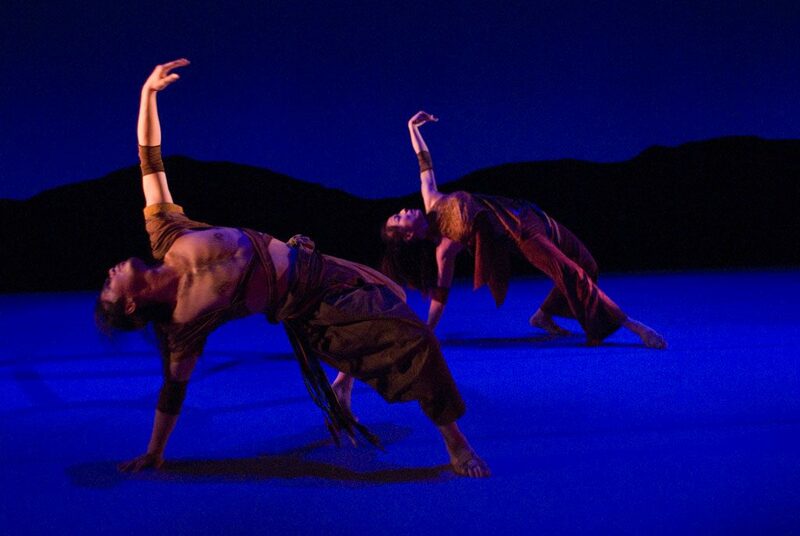 Tono is a ravishing beautiful dance work, but one that seems slightly disjointed. Sandra Laronde founded Toronto-based Red Sky Performance in 2000 to be a voice for Aboriginal arts. Her inspiration for Tono is the shared culture of the indigenous peoples of Canada, Mongolia and China’s Inner Mongolia. For both her and Montreal co-choreographer Roger Sinha, the three countries represent the endless plains that were home to the magnificent figure of the horse. Laronde’s concept also includes the idea of shamanism, which she sees as the ability to communicate with both nature and the spirit world. The bulk of the work is devoted to images of the horse and its enduring close relationship with humans. At the end, Laronde introduces the image of twins in the birth sac, with one being born alive and strong to carry on the shamanic tradition. The other is dead, presumably a liaison in the spirit world. The latter image of two female dancers encased in stretchy material that bonds to their bodies is quite startling and absolutely unexpected in light of what has gone before. It is an image that jars with the totality of the work. Three dancers from Inner Mongolia (Cai Hong, Morigen and Wei Jie) bring agile and supple bodies skilled in contortion and tumbling. The Canadians (Julie Choquette, Carlos Rivera and Raul Talamantes) are modern dancers with experience in traditional indigenous dance. Collectively they present a wide range of abilities, which the choreographers put to good use. The various evocations of the horse are gorgeous, from wild gallops to gentle, slow-motion isolation of tissues and sinews. The choreographers have given all six dancers wonderfully diverse ways of portraying speed and grace. To the women falls the elegant majesty of the horse, to the men its charismatic power. Together, they are a herd. The six recreate a stampede that builds with excitement, their closed fists wind-milling through the air depicting the flying hooves, while their bodies mimic the straining muscles. The two Mongolian women produce absolutely stunning stretches and body twists to capture the intimate exploration of the horse’s beautiful body. The Mongolian man is superb at the gymnastics and midair jump-turns that capture the horse at play. There are also images of traditional dance such as the Grass Dance to introduce the human element. Clever sequences abound. For example, two combative men face each other, as if in a fight, human to human. The surprise is that their physicality transforms itself into man and horse, with one man pulling reins out of the other’s costume. The fight, in retrospect, becomes the taming of the horse. What Tono does not really show is the shamanistic aspect unless one looks at the whole as communing with nature. There is not really a sense of the spirit world either because the choreography is so wonderfully anchored in the glorious reality of the horse itself. Composer and collaborator Rick Sacks’s score, a mix of taped and live music, is one of his best. His collaboration with onstage Mongolian singer/musicians Tuvshinjargal Damdinjav, Bat-Orshikh Bazarvaani and Batmend Baasankhuu (in traditional dress) conjures up an exotic world through low growling singing, heavy percussion, a Mongolian string instrument and Sacks’s marimba. There is also the live traditional drum by Eddy Robinson and the Morningstar River Singers. Julia Tribe’s set is a low silhouette of hills in the background, piles of stones in the foreground and an overhead wheel. Her earth-coloured costumes cunningly capture both East and West influences. At times, the lyrical parts seem repetitive, while the sequences seem to lack a coherent flow. And the birth of the twins is a very strange and bewildering end. Nonetheless, the creators should be congratulated on a wonderful achievement that embraces two different cultures with pride.